We took turns making breakfast on the picnic table. We waited our turn for the port-o-potty. We ate oatmeal, cleaned drivetrains, and slathered ourselves with chamois butter. Oh the unpacking and repacking! And where did I put this? And where did I put that? At some point I remember what I brought and where I put it, but at the beginning of day two while my mind is half down the road, and half remembering the five small tasks I must remember to do before we pedal off into the rain. If I was nervous about day one, I was slightly scared of day two. Our rollouts were pretty silent affairs. Nobody yelled “rolling out in five minutes.” You just silently stuff bags and fill bottles until it looks like everyone is ready. I like that unspoken group mind sometimes. Rolling out in the rain and chill is a bit of a somber affair that feels more like duty than a party. I had packed my 7Mesh Revelation Jacket as a “just in case” and had fretted about the extra weight. But it ended up raining two of the four days, so this piece got MVP status in the end. I just threw open the large vents and pedaled on in comfort. The day began with marshes and gentle climbing. 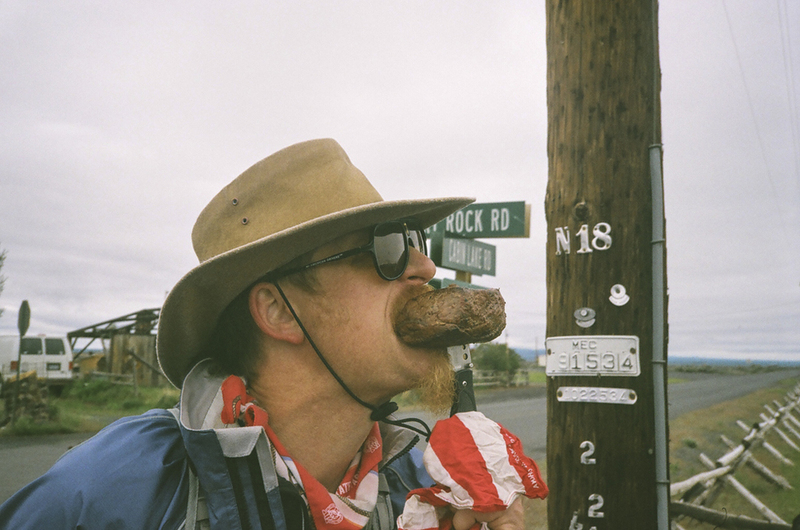 We rolled past the same guys that we rode into Silver Lake with: The Portland Mobile Grilling Club and before long we were cresting the hill with views of Fort Rock. Fort Rock is a bit of a ghost town, but they have a bar and a church. The church has a water spigot. Fort Rock is where the dreaded 70-mile-no-water stretch began, so we filled extra containers of water. Maybe it was the weather, or maybe people were nervous, but the mood was pretty solemn. One rider had just ridden from Bend and let us know that the next section is full of weekend campers on motorcycles and ATVs, so if you get desperate you could always beg water. That gave me some peace of mind. This turned out to be one of my favorite sections. I love rollers since riding them takes a bit of technique and fitness. It’s all about making the most of your momentum and my 50 pound loaded mountain bike had plenty of that. Brent and I took turns leading and the pace felt pretty decent. Brent’s friend Nick had convinced his weekend crew that meeting us in the middle of nowhere would be a fun idea. Coming towards us is an SUV driven by some dude wearing a rainbow clown wig. No big deal. Random weirdos out partying, I thought. Brent quickly turned with a “No Way, it’s Nick” and doubled back to meet them. It took them four hours to find us apparently. We took sips of whiskey and shared a beer, gave high fives and went back to our dirt rollers. We were already loaded down with emergency water for this section, so carrying anything extra would have been nuts. I felt bad that we couldn’t spend more time hanging out, but we felt the need to make progress and didn’t know what lay ahead. Luckily it had rained recently, so what was described as slow-going red pumice the year before was just another dirt road for this years riders. We spied riders on the side of the road tending to repairs. Broken spokes! A quick note on gear: please don’t ride lightweight race wheels on these multiday rides. One unlucky fellow had done just that and was busy trying to make his wheel true again. Brent gave him a spare fiberfix and luckily he had one of his own, so we wished him well and rode on. We ended up seeing him at the Good Bike Co. in Prineville at the end of the day. With two fiberfixes he was able to ride out successfully! He was super grateful for the second fiberfix. Once out of the woods, the wind was howling, so we found the only shelter near the road, a large boulder and hunkered down for a lunch break. We ate leftover steak, salami, cheese, trail mix, and chocolate. Alan rode up (still looking haggard) just as we were packing up. We wished each other well as we pushed off. Not long after our lunch break we reached a high point offering a grand vista. The clouds started clearing at this point and after a nice gravel downhill and a few miles of pavement it felt like we were getting somewhere for the day. My right knee started to hurt at this point my mind started wondering if this was a trend, or just a momentary thing. Pavement turned to dirt, which led us to miles of descending. So much descending that you have to stop and rest and keep pedaling just to stay engaged. At this point we meet up with Bear Creek and things just get greener as we approach the reservoir. One last killer climb, though before a killer descent to the reservoir. Brent and I put in headphones just to get tranced out and focused for the climb. Once at the reservoir the mood shifts. The clouds parted and we had reached the Crooked River and the Prineville Reservoir. Fantastic cliffs of columnar basalt rise above the river as swifts dart overhead. The road is essentially downhill and the mood is up! The fear of dying dehydrated at the side of the road is behind us. 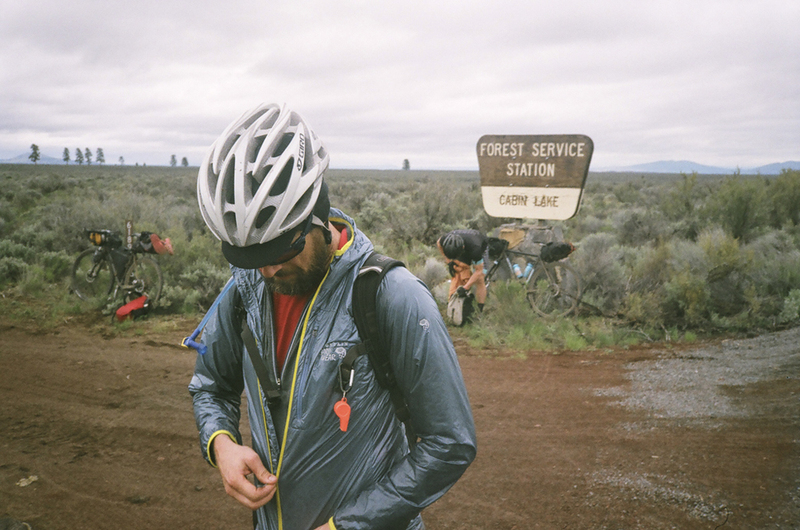 At this point it was only 20 miles to Prineville and all of it paved, so we didn’t even need to refill water bottles. Tom was fading at this point, so we decided to cold dip our legs in the river, while Tom soft pedaled ahead towards town. I had wanted to do more of this on the Outback, stopping for river dips and such, so it was a thrill to pull off my shoes and dip tired legs in cold flowing water and just take a few moments to watch birds swoop and soak in the beauty of the area, before finishing the day. 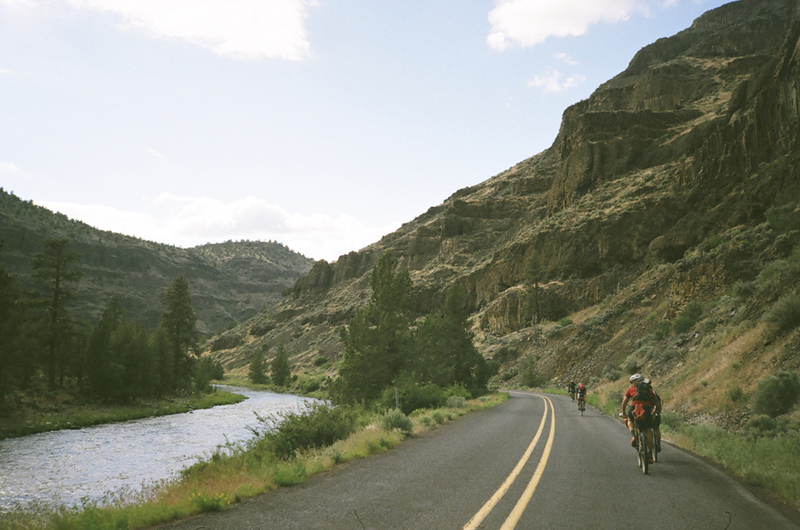 We rolled into Prineville together, grabbed pints at Good Bike Co. and then headed over to Wagner's IGA grocery where the friendly clerks told us about the Ochoco Creek Park just down the road and told us that the swim team stays there. We really didn't want to pay at the RV Park, so we did a little celebration dance and pedaled over to the park. It couldn't have been a nicer situation. We had the park to ourselves! We set up tents, bivvies, made dinner, drank some beers and felt pretty lucky. Day two had gone about as well as it could have. The weather was gentle, so we had plenty of water, The dreaded Red Sauce was actually fun, fast rollers, we soaked in the Crooked River and scored an amazing private campsite. That's winning at bikepacking.